More and more research studies are finding links between chocolate and various health related benefits. Customers visiting our chocolate shop ask about healthy chocolate often, but seem to be confused about what type of chocolate may have some health benefits, and many do not understand or even believe chocolate may be good for you. We all know chocolate makes us feel good and smile and brings on a sense of happiness and contentment. Chocolate is good for you if you choose the right type of chocolate and eat the proper amount. Keep in mind most commercially made chocolate products contain high amounts of sugar, milk or milk products, caramel, nuts, and other non healthy additives. The simple answer is dark chocolate or pure cocoa powder. Not any dark chocolate, but dark chocolate with a high cacao mass. (Cacao Mass is pure chocolate). Ingredient labels will help when you are trying to find chocolates which are healthy. 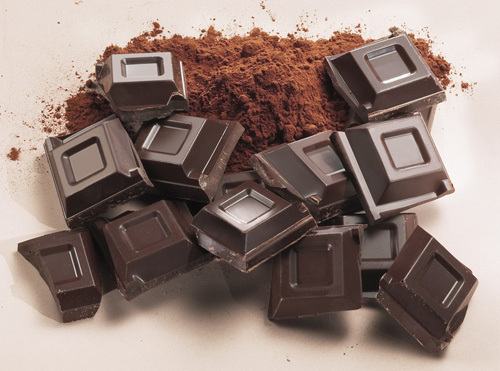 Healthy dark chocolate products will contain very few ingredients. Our Cacao Nib slab as an example, contains Cacao Mass (sometimes called chocolate liquor, dark chocolate, chocolate, chocolate solids), Cocoa Butter, Sugar, vanilla, and soy lecithin (emulsifier). The significance of the order of ingredients when thinking in terms of healthy chocolate is important. If the first ingredient is sugar, the product you are looking at is not healthy for you. It contains a minimum of 50% sugar. If the product you are looking at contains dairy products of any form, it is not a healthy chocolate. In order for a chocolate to contain the right balance of pure chocolate and sugar to be considered healthy, it must contain at least 70% cacao (chocolate). This would mean the sugar content would be under 30%. If the product has 80% Cacao, then the sugar is less than 20% and so on. The higher the cacao mass (expressed like 70% Cacao or 75% Cacao) the better for you the chocolate may be. Cocoa powder, a byproduct of the process used to make chocolate from cocoa beans, apparently has surprising health benefits. Again, reading the ingredients label is really critical. 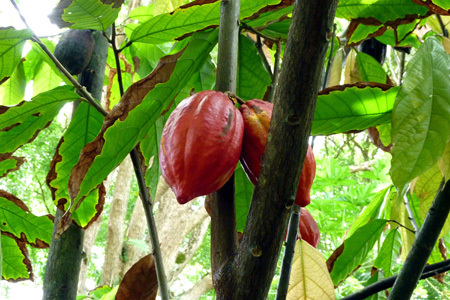 When considering purchasing cocoa powder, you want to see a label with one ingredient only. Many chocolate drink products and mixes contain other ingredients like sugars, powered milk or dairy products and so are not going to provide any health benefit to you. According to Livestrong.com, “the nutritional contents of cocoa powder are getting recognition from doctors, scientists and dietitians for the cardiovascular and weight maintenance advantages they have to offer. Mostly used for baking, cocoa powder is what’s left after removing cocoa butter from processing cocoa beans. One tablespoon, or 5 g of cocoa powder, contains only 20 calories. Of those 20 calories, there are 5 calories, or 0.5 g of fat. The remaining calories consist of 3 g of carbohydrates, 2 g of which are fiber. This amount makes cocoa powder a significant source of fiber”. The answer is more and more. According to livescince.com a 2008 study found that people who ate about 7 grams a day of dark chocolate had lower levels of a protein indicating inflammation in their blood. Other studies have found clumping of blood platelets occur more slowly in chocolate eaters. This is important since clumping platelets can lead to the formation of blood clots, which can cause all kinds of problems including an increased risk of a heart attack. Some studies have show chocolate may lower blood pressure, reduce plaque formation in your arteries, and even improve blood flow. Eating chocolate may even help with math, or at least counting. There is a study from 2009 showing people did a better job of counting backwards in groups of three after consuming a hot cocoa drink containing large amounts of flavonoids. Chocolate may also have anti-cancer benefits because flavonoids may help reduce the cell damage that can spur tumor growth. “More and more research is showing that [eating chocolate] is really more beneficial than we ever imagined,” said Katherine Tallmadge a registered dietician and spokesperson for the American Dietetic Association. However, she notes that the advantages you get still appear to be quite small. “It’s not anything major, but it’s still an advantage, and even slight advantages can make a difference for some people,” she said. Flavonoids – What are they and why should you care? Dark chocolate contains a large number of antioxidants (nearly 8 times the number found in strawberries). Flavonoids also help relax blood pressure through the production of nitric oxide, and balance certain hormones in the body. Chocolate effects are longer lasting then a good kiss? What? In 2007, the BBC published an story reporting on the publication of a rather interesting research paper. The BBC reported, when it comes to tongues, melting chocolate is better than a passionate kiss. Couples in their 20s had their heart rates and brains monitored whilst they first melted chocolate in their mouths and then kissed. Chocolate caused a more intense and longer lasting “buzz” than kissing, and doubled volunteers’ heart rates. The research was carried out by Dr David Lewis, formerly of the University of Sussex, and now of the Mind Lab. Although kissing set the heart pounding, the effect did not last as long as that seen with the chocolate, which increased heart rates from a resting rate of about 60 beats per minute to 140. Couples were monitored while they kissed and while they ate chocolate. The study also found that as the chocolate started melting, all regions of the brain received a boost far more intense and longer lasting than the excitement seen with kissing. Although women are generally thought to be bigger fans of chocolate than men, the research found the same reactions to chocolate in both sexes. Researchers believe that most of the bad effects of eating chocolate are either overstated or entirely false. For example chocolate also has not been proven to cause cavities or tooth decay. Rather, it helps thwart mouth bacteria and stop dental decay. Chocolate is full of fat? A recent study has shown that most people, around 70 per cent, believe that certain foods can cause or exacerbate acne. Chocolate was indicated as one of the main culprits. However, there is no evidence to back up this long held belief. According to scientific research to date, there are no compounds, ingredients or naturally occurring chemicals in chocolate that can either trigger acne or make it worse. So to sum all of this up, you can enjoy chocolate and also consume something good for you. Just make sure you understand what you are putting into your body and then decide.